Why am I walking through the kitchen at Steamers right now? That’s the thought I had at the beginning of this week’s Signature Dish review. No owner or chef of any restaurant I visited last year voluntarily took me through their kitchen to show off how clean and organized it was. Josh DeNapoli and Christina Capouellez aren’t your average restaurant owners — and Steamers isn’t your average restaurant. Josh and his sister opened Steamers 10 years ago after their parents bought the property with the idea of their children running the restaurant. You will notice that this isn’t your average review, either. I won’t be listing any prices. There comes a time in every foodie’s life when they hand over their wallet and don’t care how much what they just ate costs. I was at the point. Let’s start with the Shellfish Chowder. They were anything but selfish in the quantity of clam, shrimp, potato and flavor they packed in this New England-style chowder. Creamy smooth stock flavor from the seafood created one of the best chowder soups I have had. It was hearty and a great opening for the rest of this meal. Next was the first of a sampling of several small seafood appetizers — Hot and Spicy Shrimp. Josh insisted that you don’t just eat these spicy crustaceans. You have to take a slice of the tiny French baguette, butter it and then scoop up a helping of the spicy sauce and position the shrimp in such a way that you don’t bite into the tail. I love when I have rules to eat food. It shows me creativity and passion about something so simple as shrimp. Also on this plate were Blackened Tuna Bites with a chipotle-style tarter sauce. The blackened seasoning crusted on the tender tuna committed taste-bud adultery. I felt like I was having an affair on ahi tuna enjoying these tiny flavor bombs so much. The tarter sauce settled what little heat they had but complimented it all the same. I could have eaten two-dozen of these if I had my way. Last on this plate was Sesame-Crusted Calamari, which was thick fresh slices of calamari lightly crusted in a peppered breading and then covered in Thai spicy sauce. It wasn’t heavily dredged with breading. Instead, it was slightly touched so the unique flavor of the calamari could blend with the spiciness of the sauce. Next out was Seared Sea Scallops atop a portabella mushroom cap in asiago cream sauce. The words alone made my mouth water. The portabella was cooked perfectly and had that meatiness to it that I love. The scallops were seared perfectly, and as I sliced and combined them into the rich cheesy asiago sauce I couldn’t help but smile and nod my head as I chewed. We’ve all done that move as we try to mouth, Oh that is good. My first of two entr es was a Filet Smothered with Blue Cheese in a balsamic reduction. When balsamic is simmered down, it thickens and the flavor explodes. It becomes caramelized and aromatic. As I pressed my knife through the tender filet, I made sure not to interrupt the soft cheese on top. Each bite was savory with the sweet tang of the balsamic glaze. I refuse to put any sauce on the same plate as steak, but this balsamic was a perfect marriage and didn’t take away from the flavor of the meat. The second and final entr e was the Duck in Hunters Sauce with Parmesan Polenta, which was tender slices of duck in a tomato-based stew of peas, carrots, green peppers, mushrooms and onions. The combination of all the vegetables created what could have easily been a stand-alone soup. The tender pieces of duck had a small layer of fat, crispy skin and a wonderful smoke flavor. That fat layer is so important as it adds flavor and juice to what is rather dry gamey meat. I couldn’t have asked for a better dish on a cold January night. This was my favorite dish of the night, but not by much. Everything else was a very close second. I don’t know what the rest of 2013 has in store for me with these reviews, but if this is any indication, I am in for a great year of eating. Start your year off right with a meal that will impress your mouth. Steamers cares about their reputation and their attention to detail, and takes pride in the experience you have when you come in. 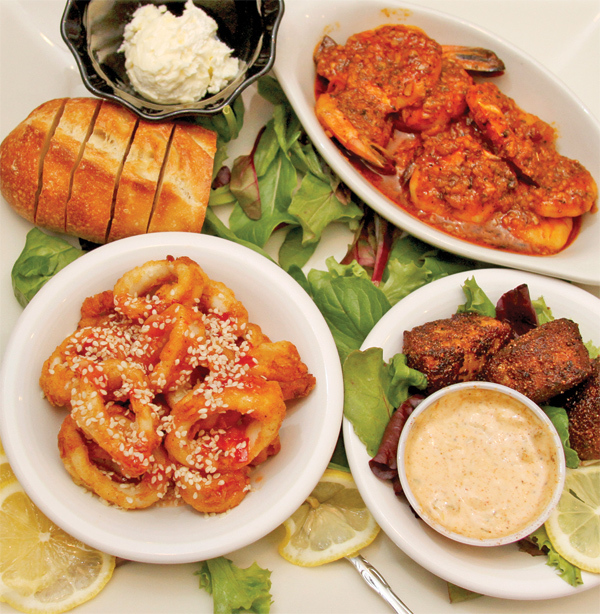 So sit down with friends and family and enjoy a flawless meal at Steamers. Ross Morrone is on the lookout for the biggest, hottest and tastiest dishes in the Valley. Email him at rossmorrone@gmail.com.